Beautiful tree... and now I am going to have to go and check out that lasagna recipe :) Woohooo! I must admit. I sorta got excited the first time I saw the guide lines on the back of the Hobby Lobby wrapping paper too. Pretty awesome!! I need to try PW's lasagna. And don't tell me how many calories are in it. I'll become very discouraged! I've not mastered wrapping, but I do love to look at all the cool wrapping paper. I heart wrapping paper. Oh gosh I can so relate to Luke, I'm counting calories like crazy lately and it is driving Garth nuts! There was a feature in the paper this morning about Pioneer Woman. 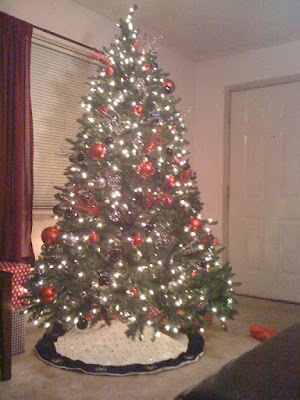 Also, love the tree-the black, red, and silver is really pretty. 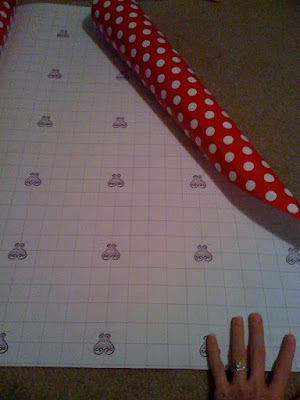 I love the grid lines on the back of wrapping paper-it makes everything so much easier! My tree and presents are color coordinated too. Actually...everything in my house is somewhat color coordinated. If I'm going to throw another color in the mix, it has to be in a different room, where it will not interfere with other color schemes. Our tree is red/white/silver and I cringe at the thought of using any wrapping paper that clashes with that. I'm a freak. Your tree is really pretty!! One of my friends is wrapping presents this year to make extra cash...I'm letting her wrap all of my gifts this year because I DESPISE doing it. I'm thinking that lasagna is definitely one of those foods that needs to be exempt from a calorie counter! That ruins all the fun. Love your tree! I actually really enjoy wrapping gifts but it definitely has taken me several years to master it! 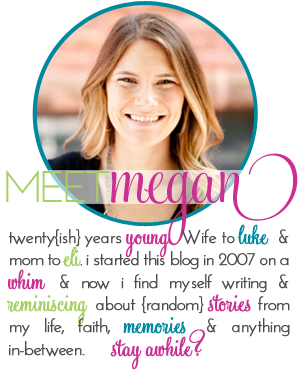 love some pioneer woman. going to make her truffles for a holiday dessert exchange. will have to try the lasagna. I love that kind of wrapping paper too...and your tree looks fab! I love wrapping presents! And those lines printed on the back of the paper are SO handy! I coordinate all my papers. I usually buy three rolls: very nice, expensive paper for my favorites, middle quality paper for most everyone else, and cheapo paper for the people I resent having to give anything to in the first place. Why is this relevant? Because all three papers must color-coordinate :). My tree is really neutral, so basically anything works with it, but when I branch out and put some color on there, I *will* match the paper to the tree! Your tree is so pretty! I love to coordinate the wrapping too - so fun! I actually had Stouffer's lasagna for dinner last night. LOL=) I am TERRIBLE, yes, capital letters terrible at wrapping presents. I have been counting calories, too, and it stinks!!! I am like you....it kinda ruins it when you hear how many calories it has as you are digging in! Sounds like a good night to me, I love that wrapping paper where did you get that? My husband would have looked at me like I was crazy like he always does when I get excited over the small things in life. yum, i use that same recipe when i make lasagna. :-) it really is the best i think! and if it makes you feel any better, i avoid buying the christmas wrapping paper that has fuschia, teal or purple, etc, on it b/c it won't make my tree or my house colors. and....if you must know, i don't really like that about myself. maybe this year i'll just let go and buy all bright and neon colored paper and say what the heck?! gosh, I need to try that lasagna ASAP!!!! I have that wrapping paper from last year..love it!! Here's a little gift wrapping tip that Casey taught me. Once the gift is wrapped, run your index and thumb along each edge of the gift (kind of like lightly pinching). As you do this, it makes a crisp edge on all sides of the package. It really makes gifts look so much better! LOVE the polka dot wrapping paper! That tree is so super pretty. I only love wrapping gifts for Christmas. I watch Christmas movies while I'm wrapping. When it's not Christmas, all gifts go in bags.